Every little girl plays dress up in her mother's clothes and imagines that she would be as beautiful as her mother if she were tall enough or old enough. Of particular interest in Mom's closet, of course, are the party clothes and accessories - hats, jewelry, scarves, belts and shows. Mama's Saris, written by Pooja Makhijani and illustrated by Elena Gomez, warmly tells this rite-of-passage story from a young Indian girl's perspective. Instead of in the closet, the Mama of this story keeps her treasured special clothing in a suitcase under the bed, carefully and lovingly folded. It is the little girl's 7th birthday and Mama is preparing to dress for the party. As the little girl helps her Mama choose the sari for today's special event, she begs and pleads to wear a sari herself. The vibrant jewel tones of the saris themselves are set against other dense patterns in the backgrounds of the bedroom wall, a photo frame and bedspread. The wonderful array of patterns emphasize the importance and beauty of special occasions when you change from your ordinary self (in this case a blue shirt and jumper) to your beautiful, festive self. For many children, this book will be their first introduction to clothing and family tradition from another culture than their own. At heart, it is a retelling of a story that children will find familiar - most having experienced some variation of it in their own homes. Taking a familiar story to a broader canvas is one of the great joys that a picture book can provide. 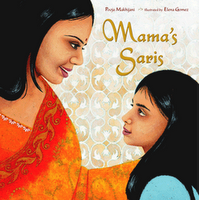 Mama's Saris is terrific reminder to all of us of the universality of our life experiences no matter where we live.